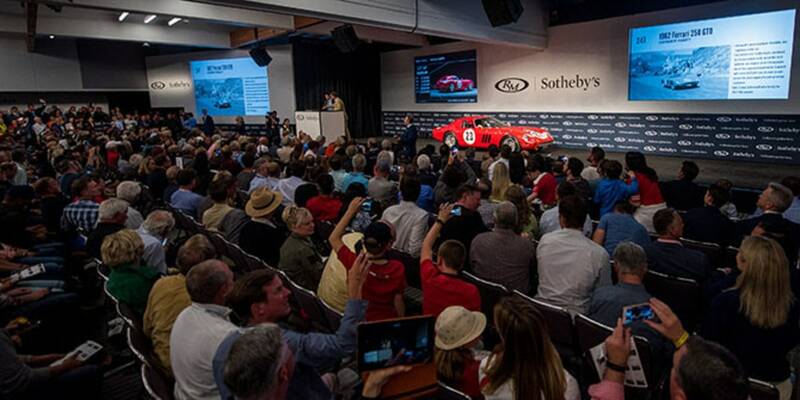 With $157,931,940 in total sales and 83% of all lots sold, the RM Sotheby’s 2018 Monterey auction was one for the record books. The biggest story of the weekend came Saturday night, when the 1962 Ferrari 250 GTO set a new high watermark for the most valuable car ever sold at auction, achieving an astounding $48,400,000. The GTO was just one of many stand-out results from the two-day sale, which saw the 1963 Aston Martin DP215 Grand Touring Competition Prototype sell for $21,455,000 after an intense round of bidding on the phone desk. The 1966 Ford GT40 Mk II, part of the iconic trio of GT40s that swept the 1966 24 Hours of Le Mans, reached $9,795,000, while the 1957 Porsche 550A Spyder, an important car in the history of Porsche racing in America, sold for $4,900,000. The strikingly beautiful 1956 Maserati A6G/2000 Zagato set a new record for the model at auction, earning $4,515,000. We are deeply appreciative of our clients who have entrusted RM Sotheby’s to offer some of the most significant motor cars to ever come to market, and equally grateful to our clients, enthusiasts, and media who traveled from all over the world to attend our sale. Click below to see all the fantastic auction results, and be sure to follow along as the RM Sotheby’s Group next heads to Auburn, Indiana, for the Labor Day tradition that is the Auburn Fall auction, where over 750 cars will be offered for sale; and to London, UK, where we will be hosting our 12th annual London sale on 5 September at Battersea Evolution.